I'm not a huge fan of Chinese takeaways, but when I do 'indulge', it is usually Sichuan Chicken that I go for. This recipe, however, is a million times better than any takeaway. I got the recipe for Sichuan Aubergine from The School of Wok, the recipe written by Head Chef Jeremy Pang, and adapted it so there was meat in it. Not that I'm biased or anything (ok, I am) but the Asian food I've learnt to make at the School has been, without exception, fantastic. Perhaps it's the home-cookedness of it, knowing everything that you have put into your dish, or perhaps it's what really Chinese food is like, (i.e. not oily takeaways) - or perhaps both. 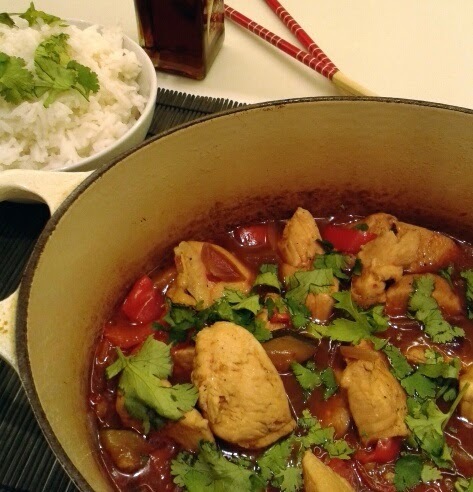 You can find the recipe on the School of Wok blog (written by yours truly, incidently!). The ingredients you will be able to find in an Asian supermarket. To use chicken instead of, or in addition to, aubergine, just season some flour, or even better, cornflour, and dip strips of chicken breast in it, then sear them until lightly browned, then remove them from the pan, and continue with step 3. Be sure to add it back in before you bake it! You can also add in some peppers or other vegetables if you wish. The perfect dish to serve up on Chinese New Year!